What should I do if I have been drinking and I’m pulled over by the police? In Georgia, what should I do If I have been drinking and I am pulled over by the police? The most important thing to remember is to be polite with the police officer. Acting rude or being confrontational the officer will only land you in jail more quickly. You do not have the right to an attorney at the time of being pulled over, however, a simple request to speak to your attorney before answering questions would be an appropriate response. 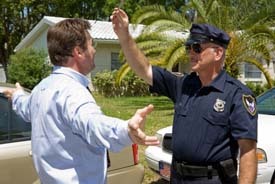 You DO have the right to refuse all field sobriety tests – the one leg stand, the eye test (HGN test), touching your nose, walk and turn, and any other street evaluation is not required and is usually not a good. These tests simply help the officer build a stronger case against you. Do not help them with their job as they intend to use the results of any test against you in court. You DO have the right to refuse the breathalyzer, blood, or urine tests. Remember however, if you do this, you face a one-year suspension of your driver's license. It may be in your best interest, and it is your right, to request an INDEPENDENT blood or urine test. The officer is required to provide you with additional reasonable testing at your own expense. You are probably being recorded. Watch how you act and what you say. You do not have to answer an officer's questions about whether you had anything to drink that night, where you were coming from, etc.